Quote: Veteran U.K. thrashers XENTRIX have inked a deal with Listenable Records. The band's new album, "Bury The Pain", will be released in the summer. The disc was produced by Andy Sneap and mastered by Russ Russell. The cover artwork for the album was created by Dan Goldsworthy and can be seen below. 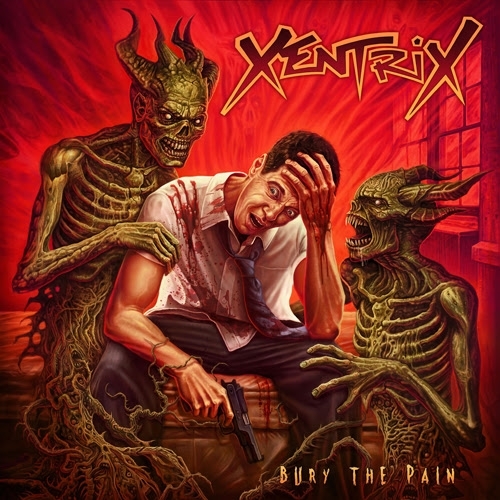 XENTRIX made its live debut with new guitarist/vocalist Jay Walsh (BULL-RIFF STAMPEDE) in August 2017 at the Bloodstock Open Air festival at Catton Hall, Walton-On-Trent, West Midlands, United Kingdom. Walsh joined XENTRIX as the replacement for Chris Astley, who left the band at the end of 2015. XENTRIX — with Chris Astley on guitar and vocals — played its first show in almost seven years in April 2013 at the Moses Gate in Bolton, England. Prior to that, XENTRIX had reunited with its original lineup in 2006 for two gigs in the band's home country. Hmm interesting. I'll have to keep my eye on this one. I never gave this band attention back then.Time to check em out.